Mané is a young swiss pop singer/songwriter who just released her first single «All I Need». She is now preparing a first EP for Fall 2017 and needs your help to make it come alive. Mané is a young pop singer/songwriter from Lausanne, Switzerland. Does she already have some music out? 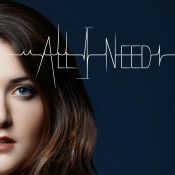 She released her first single «All I Need», arranged by producers Yaacov Salah and Meïr Salah (Slimane, Marina Kaye). She also released a music video for it, directed by Mei Fa Tan. What is she working on right now? She is now preparing the release of her first EP for Fall 2017. Why does she need your support? Mané is an independent artist and needs your support to make her EP come alive. For the past 10 years, she has invested all her time, hard work and resources in her music. Her purpose in Life is to share her passion with her fans and she needs help to keep nurturing her art. Do you want to be a part of her story? You can help her out by participating in the making of this CD and receive exclusive gifts and prizes in exchange. There are magical and essential ingredients needed in order to create an EP … So what kind of costs will your investment support? What will you receive in exchange of your support ? Mané offers you a wide selection of rewards to choose from, in exchange of the amount you would like to invest in her project. Wether you would like to participate for yourself or offer something to a friend, the choice is yours! If you have any questions, feel free to message Mané at : info@mane-music.com and she will reply with pleasure. This project ended successfully on 1/9/2017 19:00! She has just released her first single "All I Need", produced by MEYA MUSIC (Slimane, Marina Kaye) and she is now preparing the release of her upcoming EP for Fall 2017.